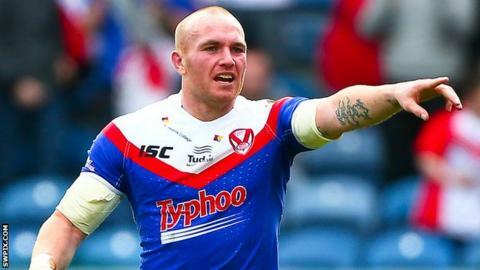 St Helens scrum-half Luke Walsh has admitted he feared his career would be ended by the horrific injury he suffered in July. The 27-year-old broke his fibula and tore ankle ligaments against Widnes. Walsh should be fit to return at the start of 2015, after initial fears that the injury was far worse. "When I first saw it, I thought that was it - it was my career over," said the Australian. "I was thinking all sorts of stuff. Thankfully it was OK."
Walsh made an impressive start to his Super League career, helping Nathan Brown's side to top spot in the table before his injury, and will be an interested spectator in the closing weeks of the season as Saints look to secure their first trophy since 2008. He is progressing well after surgery, telling the club website: "The cast comes off shortly and then I'll have a boot on for four weeks and I can get back walking. "It wasn't as bad as we first feared but it will be a long process. It's been a frustrating year as I've had a few injuries but this certainly is the biggest of my career. "I can't thank the fans enough. All the support I've had since the injury has been crazy. I've had people coming up to me saying 'get well' and it has surprised me. They are the best fans I've been involved with."